American Discover Publishing designs, produces and publishes The Prime Buyers’ Report,™ an interactive, easy-to-use buyers’ directory that provides everything a shopper needs to make informed, confident decisions regarding the services and products of hundreds of companies offering a wide array of products and services. 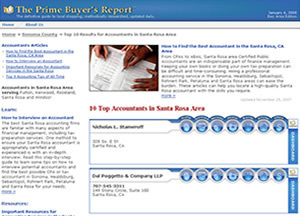 By providing a plethora of information on licensing, certifications, background and specialties, as well as customer reviews, photographs, brands and more, the Prime Buyer’s Report™ is the definitive directory for discerning, educated consumers. Throughout the Prime Buyer’s Report™, shoppers are provided with articles highlighting the best way to find the vendors and companies they are searching for, along with industry-specific articles providing tips on not only what companies to buy from, but how to buy from them.